The Type 81 missile system, also known as the Tan-SAM, is a short-range, self-propelled, surface-to-air missile developed by the Japanese military. 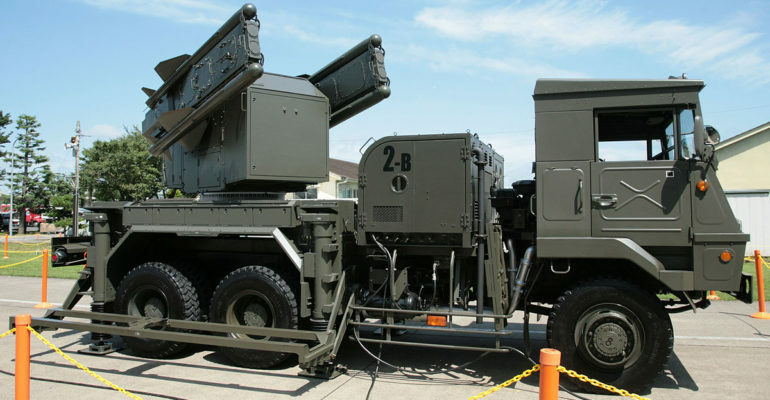 It was developed to fill the gap between the portable but manned Stinger missile and the fixed position Hawk missiles. [i] The system operates two launch vehicles and one fire control vehicle with a roof mounted radar. [ii] The radar can be used in three different modes: an omni-directional search, a sector search/course tracking mode which allows the system to track up to 6 targets within the same 110-degree field, and a fire tracking mode which can track 2 targets with greater accuracy. [iii] The missiles launched by the Type 81 have undergone two upgrades since it was developed. Tan-SAM-1: The original missile with an infrared seeker. The greater mobility of the Type 81 provides the capability for the Japanese armed forces to operate it within a greater range of area, while also maintaining the capability of intercepting multiple targets. The variable radar modes and the kai upgrade also allow the Type 81 to track with greater accuracy, increasing the rate of success for the system.